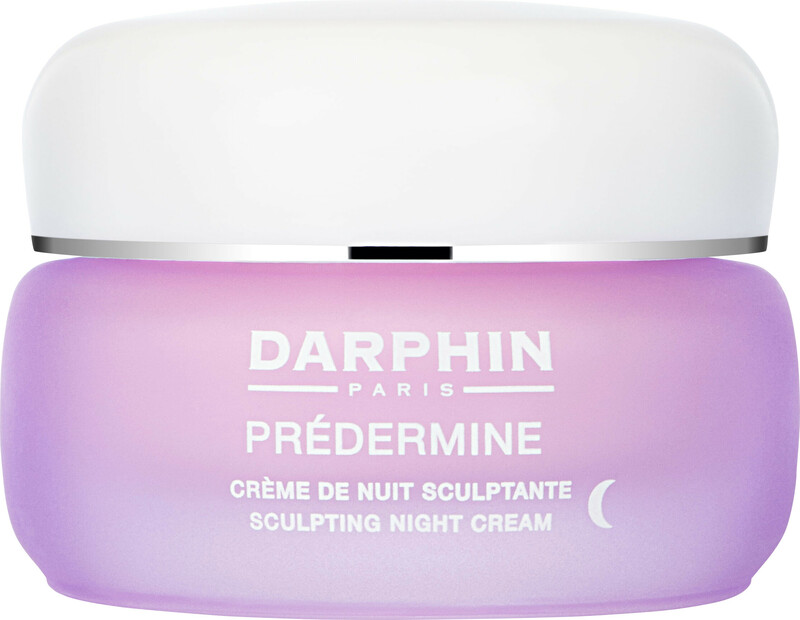 Lift, firm and enhance your skin while you sleep with the Darphin Prédermine Sculpting Night Cream, a rejuvenating night cream that will reboot collagen production. 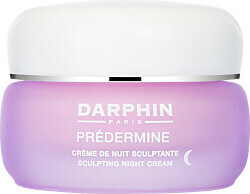 The Darphin Prédermine Sculpting Night Cream will re-define the contours of a mature skin type that wants to look visibly lifted and youthfully radiant. Designed to repair the skin’s natural barrier as you rest, the restorative power of night blooming tuberose and time-released vitamins boost elastin and collagen production. Working overnight to support the skin’s natural regenerative system, the Darphin Prédermine Sculpting Night Cream smoothes away wrinkles and fine lines, creating a complexion that looks plump and well-rested by morning. Apply a pea size amount to the face and neck after cleansing and toning. Massage gently with fingertips in an upward motion from the inner to the outer part of the face. WATER\AQUA\EAU, BUTYROSPERMUM PARKII (SHEA BUTTER), BUTYLENE GLYCOL, SIMMONDSIA CHINENSIS (JOJOBA) SEED OIL, ORYZA SATIVA (RICE) BRAN OIL, GLYCERYL STEARATE, PEG-100 STEARATE, THEOBROMA CACAO (COCOA) SEED BUTTER, PROPANEDIOL, HYDROGENATED VEGETABLE OIL, TRIDECYL TRIMELLITATE, SQUALANE, TRIBEHENIN, POLYGLYCERYL-3 METHYLGLUCOSE DISTEARATE, TRIISOSTEARIN, GLYCERIN, CETEARYL OLIVATE, CETYL ALCOHOL, DIGLYCERIN, MENYANTHES TRIFOLIATA (BUCKBEAN) LEAF EXTRACT, HIBISCUS SABDARIFFA FLOWER EXTRACT, HORDEUM VULGARE (BARLEY) EXTRACT\EXTRAIT D'ORGE, PRUNUS AMYGDALUS DULCIS (SWEET ALMOND) SEED EXTRACT, GELLIDIELLA ACEROSA EXTRACT, HYPNEA MUSCIFORMIS (ALGAE) EXTRACT, EQUISETUM ARVENSE (HORSETAIL) EXTRACT, CUCUMIS SATIVUS (CUCUMBER) FRUIT EXTRACT, IRIS PALLIDA ROOT EXTRACT, PALMITOYL TETRAPEPTIDE-7, IRIS FLORENTINA ROOT EXTRACT, PPG-26-BUTETH-26, ACETYL GLUCOSAMINE, CAFFEINE, GLUCOSE, PALMITOYL TRIPEPTIDE-1, PALMITOYL TRIPEPTIDE-5, ORYZA SATIVA (RICE) BRAN EXTRACT, ACETYL HEXAPEPTIDE-8, ETHYLHEXYLGLYCERIN, POLIANTHES TUBEROSA POLYSACCHARIDE, CHONDRUS CRISPUS (CARRAGEENAN), YEAST EXTRACT\FAEX\EXTRAIT DE LEVURE, PROPYLENE GLYCOL DICAPRATE, PALMITOYL HEXAPEPTIDE-12, SORBITAN OLIVATE, GLYCINE SOJA (SOYBEAN) PROTEIN, SODIUM HYALURONATE, TOCOPHERYL ACETATE, ETHYLHEXYL PALMITATE, HELIANTHUS ANNUUS (SUNFLOWER) SEEDCAKE, GLYCERYL POLYMETHACRYLATE, POTASSIUM CETYL PHOSPHATE, CAPRYLYL GLYCOL, FRAGRANCE (PARFUM), CARBOMER, CELLULOSE GUM, POLYSORBATE 20, PHYTIC ACID, PEG-8, TETRAHEXYLDECYL ASCORBATE, HEXYLENE GLYCOL, SODIUM HYDROXIDE, PEG-40 HYDROGENATED CASTOR OIL, DIPROPYLENE GLYCOL, ETHYLHEXYL METHOXYCINNAMATE, BUTYL METHOXYDIBENZOYLMETHANE, ETHYLHEXYL SALICYLATE, XANTHAN GUM, SILICA DIMETHYL SILYLATE, TETRASODIUM EDTA, BHT, PHENOXYETHANOL, HEXYL CINNAMAL, BENZYL SALICYLATE, ALPHA-ISOMETHYL IONONE, BUTYLPHENYL METHYLPROPIONAL, HYDROXYCITRONELLAL, CITRONELLOL, LINALOOL, AMYL CINNAMAL, LIMONENE, GERANIOL, CITRAL, COUMARIN, RED 4 (CI 14700), EXT. VIOLET 2 (CI 60730).